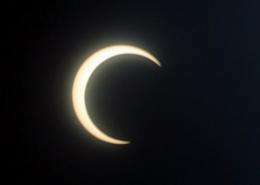 A solar eclipse viewed from Colombo. A solar eclipse that reduced the sun to a blazing ring surrounding a sombre disk plunged parts of Africa and Asia into an eerie semi-darkness. A solar eclipse that reduced the sun to a blazing ring surrounding a sombre disk plunged millions of people in Africa and Asia into an eerie semi-darkness on Friday. The spectacle, visible in a roughly 300-kilometre (185-mile) band running 12,900 kilometres (8,062 miles) across the globe, set a record for the longest annular eclipse that will remain unbeaten for more than a thousand years. An annular eclipse occurs when the Moon passes directly in front of the Sun but does not completely obscure it, thus leaving a ring -- an annulus -- of sunlight flaring around the lunar disk. The Moon's shadow first struck the southwestern tip of Chad and western Central African Republic at 0514 GMT and then reached Uganda, Kenya, and Somalia before racing across India, Bangladesh, Myanmar and China. Local media in the affected areas issued warnings about the dangers of looking directly at the sun, but fascinated onlookers thronged streets to witness the celestial phenomenon. "It's getting interesting. Birds are singing. It's actually getting cold here," said John Saitega, a 34-year-old father of six in Olte Tefi, 50 kilometres (30 miles) south of Nairobi. In India, where the eclipse was visible from the southern-most tip, astronomers and curious spectators watched in awe, using sunglasses and even ultra-dark welding masks as day turned into darkness. There were cheers and applause in the city of Bangalore when clouds cleared just in time to show the Moon glide into position to cover about 85 percent of the Sun. Veteran eclipse chaser Daniel Fischer from German astronomy magazine Interstellarum picked a vantage spot on a cliff in Varkala, 62 kilometres (38 miles) north of the city of Thiruvananthapuram in the Indian state of Kerala. "I'm thrilled. My first eclipse was Indonesia in 1983," said Fischer, who has witnessed 23 eclipses in total. The Bangalore-based Indian Space Research Organisation (ISRO) launched three small rockets on Thursday and another five on Friday to study the effects of the event on the atmosphere. "We will compare the data obtained on normal days with data during and immediately after the eclipse to study the difference," project director P. Ratnakar Rao told AFP from Thiruvananthapuram. The eclipse, which was followed live on cable television in India and China, temporarily put a halt to the world's biggest religious gathering in northern India. Temples in Haridwar, site of the Kumbh Mela which sees millions of Hindus bathe in the holy river Ganges, were closed for the duration of the eclipse because the phenomenon is considered inauspicious, an organiser told AFP. Residents in the Ugandan capital Kampala got a good view, although some were afraid of the intensity of the light, with many sharing dark glasses to gaze up at the sky. "Can't it burn someone? You can't even look direct because I'm fearing for my eyes. I'm fearing it can burn me," said Angela Namukwaya, a shopkeeper in a Kampala suburb. The maximum duration of "annularity" -- the time the moon is in front of the sun --- was 11 minutes, eight seconds at 0706 GMT, making it "the longest annular eclipse of the 3rd Millennium," according to NASA. Only on December 23, 3043 will this record be beaten. In China's capital, Beijing, a partial eclipse made a crescent of the setting orange sun before the lunar shadow expired over the Shandong peninsula at 0859 GMT. "It's cool. The weather conditions are pretty good. It's really rather magnificent," said one male Beijing high school student, one of about 40 observing the eclipse from Coal Hill, overlooking the Forbidden City.